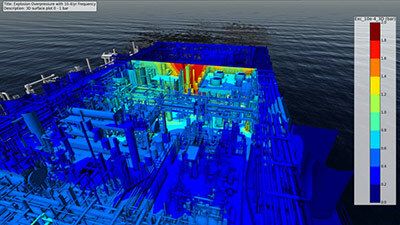 FLACS-Risk is a new, unique software solution for 3D CFD risk modelling and visualization. The tool allows risk-owners to design facilities that are significantly more cost effective, while still maintaining the required high safety levels. The FLACS software gives accurate answers about explosion overpressures, toxic gas concentrations and heat loads, which is critical input when designing facilities with explosion, toxic and fire hazards. 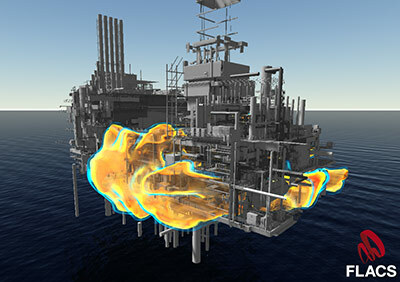 The benefit of FLACS-Risk is clear 3D visualization of risk calculation data, which can be communicated to risk-owners more efficiently than ever before. Traditionally, the task of calculating the extent of risk in hazardous environments has been reserved for a few, high-end safety consultancies. The challenge has also been that such studies take long to conduct. The unique quality of FLACS-Risk is that you can show the full 3D risk picture. By identifying structural hotspots, the risk-owners can design structures with reinforcements in areas of high forces and not uniformly reinforce for the highest force anywhere. FLACS-Risk will have integrated quality assurance functions and give less room for error. Consistency in output between different users will improve, with far less time spent in the project. An important part of FLACS-Risk is the ability to run and manage many simulations efficiently. Originally FLACS was developed to run a hand-full of simulations, while for risk studies you need to run hundreds or thousands of simulations. The first commercial version of FLACS-Risk will have some limitations, most importantly no explosions. However, many risk-owners will benefit greatly from a 3D FLACS risk tool that provides valuable output from risk studies on dispersion and jet fires. The launch of FLACS-Risk complements our existing software portfolio. We believe that companies can achieve significant cost and time saving by standardising on a single software tool that resolves both consequence and risk simulations. The FLACS-Risk v1.0 module was released on Monday 13th March 2017. Get in touch at ussoftware@gexcon.com for further information about FLACS-Risk.